There have been changes in the Old Spitalfields Market recently, most notably the construction of permanent serving hatches at the centre of the market selling more expensive food. This development is part of the management’s plan to maximise income by introducing new upscale traders and increasing rents, yet the repercussions of this policy for some of the long-establised traders have been devastating. Souvenir-seller Zareena Malik was ejected from the market recently at short notice and she told me that many as seven other traders were forced to leave the same time. 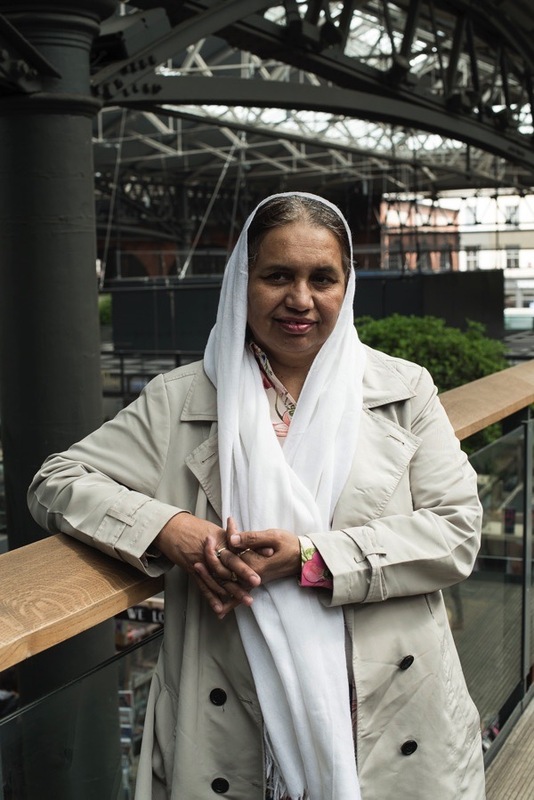 The Spitalfields Market has been an important asset for people in the East End for centuries and markets have always been essential to London as arenas of opportunity and entrepreneurship, which makes Zareena’s story especially disappointing. “In 2009, I was just looking for a place to have a stall and sell things, so I asked someone who told me I should go to Commercial Rd to buy stock and, while I was looking for the place, I came here to the Spitalfields Market by accident. So I asked for a stall and they said I could have one. At that time, it was just £10 rent for a stall for three days on Monday, Tuesday and Wednesday. So me and my son, Adnan, we started selling souvenirs of London – t-shirts, key-rings and magnets – and we were there six days a week. There was no market on Saturdays then and the rent for a stall on Sunday was £65. It was very slow for us because we did not get many tourists at that time but slowly it improved. We were selling and buying but – to be honest – we never made any money. Sometimes we took £100 a day but once you have paid the rent and covered the costs of eating and travelling for two people, you can take half of that away. Luckily, I have two sons and two daughters and my other son and my daughters had jobs. We all live together and we share all the bills and the rent and everything. Sometimes I made some money and other times I did not, but gradually my business began to work. I wake up each day at five and I used to leave to come to Spitalfields at seven by train. I had storage in the market basement for my stock and I had to carry it up every day which was really hard work. I got a big trolley and pushed it into the lift and across the market. Originally, my stall was in the middle of the market but then they built the food serving hatches and moved me to the side with six or seven stalls in front of me and my turnover fell to a quarter. So I asked the management to give me another place because nobody came to the part of the market where I was and I could not sell anything. Last year, I went back to my country for a visit and, when I came back last October, the lift which I used to transport my stock from the basement was not working, it was shut down for three weeks. They gave me somewhere to store my stock upstairs instead but then someone stole between £1700-£1800 of my things. There was no adequate security. For many years, I have had a good relationship with the Old Spitalfields Market management, so I do not understand what has gone wrong. They never gave me any reason. The manager came to me on a Wednesday and said, ‘I have to tell you something – you can’t trade here anymore.’ I asked, ‘Please give me some time to clear my stock.’ At that time, I was only trading Monday to Wednesday at £20 rent a day, because having a stall at the weekends had become too expensive for me – £75 on Saturday and £85 on Sunday. They spoke to me on a Wednesday and they gave me three days in the next week before I left. But then my daughter Natasha tweeted, criticising what they had done to me, and they told me not to come back. Essentially, they gave me no notice. I had already bought my summer stock. If I had been given a month, I could have reduced my stock and made plans to go elsewhere. This saddens and sickens me, the poor lovely woman. Thank you for being such a good soul, for using your writing skills to alert us to the terrible consequences resulting from the gentrification of Old Spitalfields. My ancestors lived in the area. One, John Tilby, was a butcher on Commercial Road. I feel sure this trader and others like her embrace the old tradition that is the life of the markets. Raising the rent and putting in higher end businesses with their desire for profit and failure to act in a community way will kill the spirit of this area. I can assure these developers that it will kill tourism. London is no longer as alluring as it once was because the real grafters are being cast out. I can hear the Old Bells tolling in despair. What a sad story. I’m presuming it was the market inspector who ejected you. Try speaking to the council. Everybody has a line manager, and you deserve an explanation if nothing else. If you get no joy from the council, yes – there are plenty of other covered markets in London. There is no doubt about it, Spitalfields is being socially and economically cleansed. As fond of it as we are, it has lost its bohemian, individual theme, where there was a place for everyone. The atmosphere on a Sunday was completely magical. Now it’s LoulouLemon and Chanel. At one time it was full of some of the most creative people in London. Young new designers making the most beautiful skirts, jackets and jewellery. You could tolerate that, with the creatives present. Now it’s looking more like a mall, with a few market stalls thrown in at the sides and a lot of jewellery stalls. That’s not to diminish the value of the stalls left. Traders are clearly leaving and/or being driven out. Rents are too high to keep new traders (we know this as we were heard the discussion on Sunday). Spitalfields can’t keep new stalls easily as the rents are too high for start ups before they’ve had time to build up a customer base for their product. Apparently the market are considering ways to attract and keep new traders by introductory rents and even free trial periods. Times are clearly hard. It’s strange therefore they’d tell stalls to go. I’m sad for Zareena. She traded that long there, so there was clearly a demand for her product. Sadly what she sells doesn’t seem to fit in with Spitalfield Market Managements ‘vision’, and that’s a crying shame as they have already ripped the heart and soul out of this beautiful, historic market site. From what I can see, and I’ve been a devotee for decades, footfall has been severely affected on Sundays. It was once hard to walk around as it was so busy. That is not a problem now. It’s been cleansed of what had become so loved about it. Good luck to Zareena, it’s terrible the market management appear to have handled this so badly. It’s always best to end even negative situations on a professional and fair note. Perhaps they should just be honest about what they want for Spitalfields and where they are going with this. But I think we already know where and sadly the Sunday footfall has already voted with its feet. Casual, subtle, every day racism. I’m shocked at how this hard working lady had been treated and caste aside now that the market had become fashionable. I for one will not be spending my money at this venue in the future. Markets are meant to be for street traders not the high street chains. How sad! It’s always been so easy for “the big guys” to push aside the little people. Nothing changes in this world but as always, there are so many beautiful folk. I hope a new door opens very soon for Zareena. Shameful behaviour by the market. It has the taste of racism. I am so sorry for Zareena! Is there anything she could do to highlight her predicament like inform the local paper? I wish her & her family all the best. Another victim of landlord’s greed putting an end to someone’s livelihood. Walk around the streets of London and see the boarded up shop fronts, even in more affluent areas. I am sad to hear that Zareena has been treated with so little respect. Everyone deserves a conversation at least, even if the outcome is disappointing. Our little row of shops in South End Green in Hampstead is being changed by landlords who serve the interests of their investors rather than the community. Independent businesses are at risk: even established ones like Daunt Books. I hope Zareena finds a new location and perhaps a chance to establish her knitting idea, with people who listen to what she has to say. How sad. Spitalfields has lost its soul. So sorry this is happening in a much beloved area of London. I moved to the US many years ago, but just returned on a quick trip to London after a four year absence and noticed how ‘Americanized’ and modernized everything is becoming .. from the pubs to the street markets, I felt as though I could be anywhere in the world. Sad loss of identity, as this story bares out. Wish this hardworking lady good luck – hope people pick up her cause and she gets her pitch back. (Granddaughter and niece of ex East End market traders who worked in all kinds of weather to make a meager living). I really dislike the food orientation in the market now, it has killed the soul of the space. It was bad enough when more and more closed events started arriving. I was probably one of those visitors that higher price stuff was aimed at but to me it has become uninteresting except perhaps for the thursday antiques. Nooooo, after the heart-warming positivity of Wednesday’s Roman Road post, today’s account has plummeted us back to the reality with this miserable report of market management and its bullying. I’m not shocked just appalled and continually saddened but also want to underscore Julia Harrison’s point about the happenings at South End Green because I live close by too. Network Rail is pressuring long standing businesses into unaffordable rent demands with reckless disregard for community needs. Once lost, never recovered. 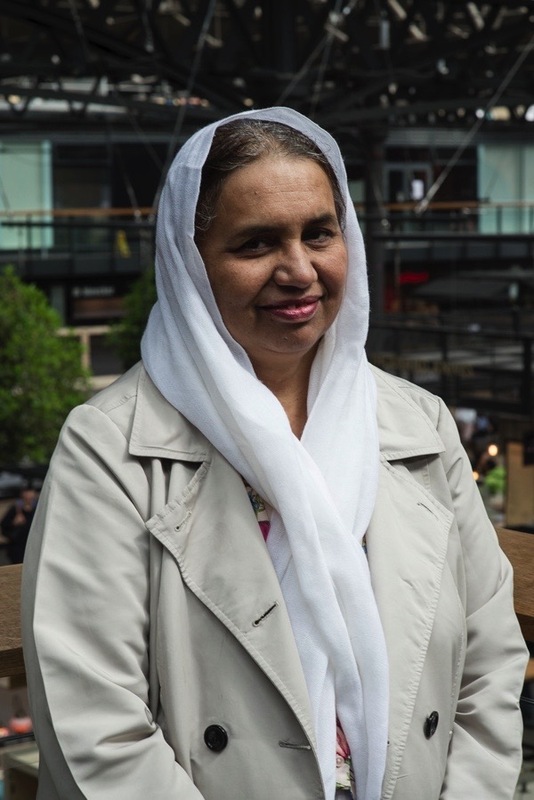 The wreckage of what Spitalfields Market once was is a disgrace and seriously, is this what visitors believe London to be…..no words except to offer commiserations and support to Zareena and her family. There must have been a class at the western worlds universities around five-ten years ago,teaching architecture and marketing students about malls and ways to improve rental incomes. Why? because every where across the western world the same damn thing is happening. Bohemian style markets are being closed down because the food outlets who were moved in to increase the land lords income are failing.Failing , because their products are too expensive and highly pretentious ,and those rents rise every 18 months,eating up most of the profits. If we wanted to shop for stuff in malls we would go to the nearest Westfeilds or who ever and burn the plastic. But if it means fresh veges and interesting nick knacks then it was always markets .Such a pity the Spitalfeilds markets are being wiped out by the self appointed,over paid arbiters of marketing genius. In the old days, the markets were a place where ANYONE with no formal education and a little english could start work with very little income and build a business with hard work and determination. Where are you Sadiq Khan! Get on the case!